Gbanga Millform AG is a dedicated game studio and pioneer in location-based mixed-reality mobile games and ad games which are regularly featured in App Stores. In this blog, we write intermittently about aspects in game design and game production. There is a long tradition and debate how games are specified and written down in text to define not only the game idea and game mechanic, but also the look and feel of a game. We at Gbanga have noticed that Customer Journey Maps or Player Journey Maps are a helpful and relevant tool to envision the player’s emotional and functional path throughout a game. The advantage of using the theory of Customer Journey is that it is originally widely used in product design and marketing and therefore well described with plenty of tools and worksheets available online. How does it translate to games? Initially completely unaware, the user discovers a brand or offering in the awarenessphase. Awareness in games is triggered through word-of-mouth, game reviews, advertising, etc. Aware users then enter the favorability phase that then belief in the offering and investigate further. Players in favour of a specific genre or game then evaluate the best game in that genre, watches gameplay videos on YouTube, etc. In the consideration phase, the customer considers the purchase. She then checks the pricing at different shops, availability, required peripherals, hardware, etc. In the intent of purchase phase, the customer already decides where to purchase (cheapest place, best service, etc.). In games, the player might decide to go to a certain retailer store nearby his house that has the unit available. Conversion is the phase, where the purchase is made. The player buys the game and (hopefully) immediately starts playing it. Of course, this funnel concept translates in different abstractions layers. The interpretation above looks at the purchasing process of a regular console game purchase. 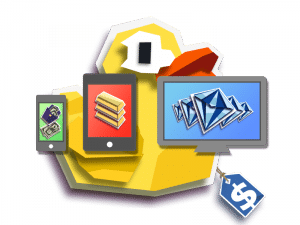 One can also look at Freemium games and the journey within the game. And, as we do it at Gbanga, the tool can be used completely without monetary purchases in mind, but only with conversion to play and spend time within the game. The Customer Journey Map or Player Journey Map is best drawn on a whiteboard or on a flip-chart (or in a graphics editing program). Fans of the famous Business Model Canvasmethod are well aware that the creation of such a map is a collective task and therefore, large whiteboards are better than electronic programs. Post-its and pin board notes are also a quick way to move and modify the map. The map normally consists of a horizontal arrow from left to right that indicates the temporal sequence of happenings on the customer’s journey. The different phases described above are laid out on the horizontal axis from left to right: Awareness, Favorability, … Conversion. For a mobile game, the following phases could be used:Internet research, App Store, Game Installed, Game Tutorial, First Level, …, Game Over. Goals: what should be achieved in this phase? Motivations: why would the player want to do this? Questions: what might be not clear to the player? Barriers: what could prevent the player from advancing? What could be frustrating? Touchpoints: when, how, why and with what is the player in touch? Is it the manual? Or the joystick or the support hotline? The resulting grid is then filled with the answers. The row for touchpoints can then be filled with a path over a bunch of media channels or screens. One can also rate the touch points to be critical decision points (moments of truth) or softer interactions. The simple example graphic above shows such an emotional roller coaster for our recent game After Party. 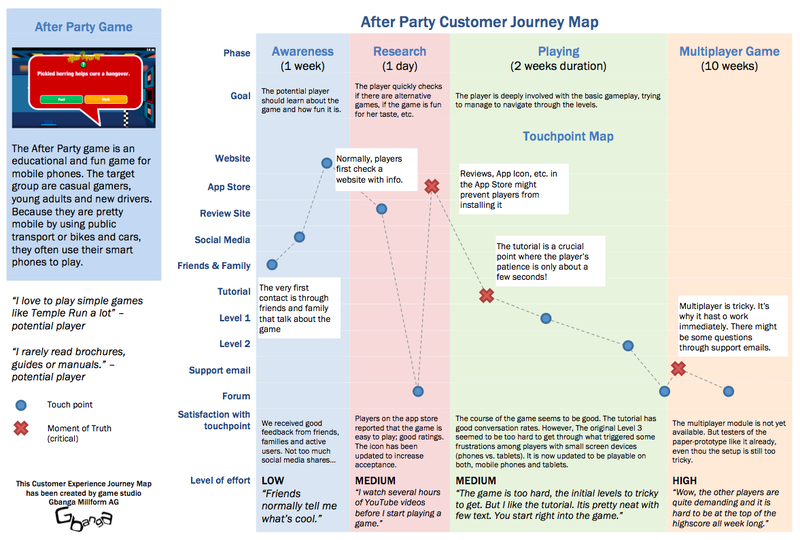 The concept of Customer Journey Maps, Player Journey Maps or «Player’s Journey» (as Amy Jo Kim calls it) is very flexible and can be applied very creatively without being to strict about the columns and row labels. It is a great source for discussions among the team and also a great opportunity to be on the same page. Possible axis labels include tutorial steps, levels, experience levels, dialog sequences (in adventure games), game overs, etc. PS: the UK civil service website also has a nice overview of how Customer Journey Mapping works.